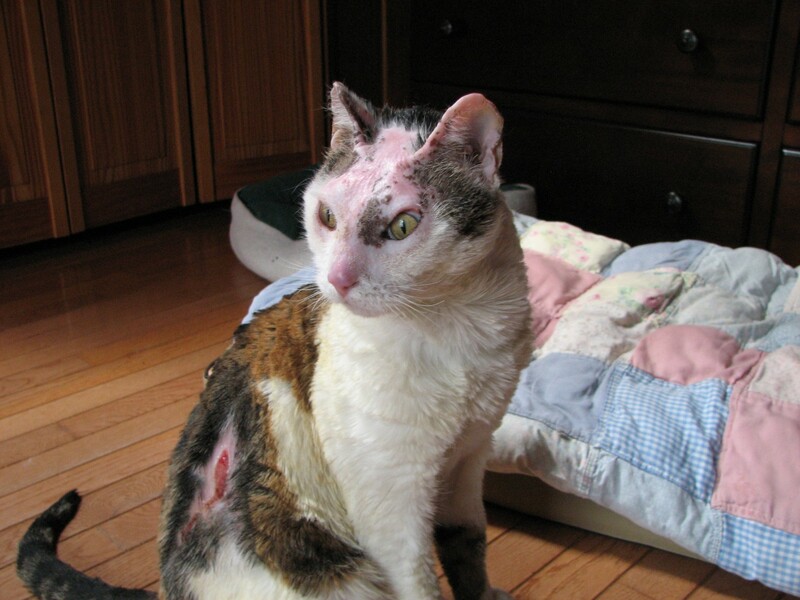 If you ask Larry’s family about him, they’ll tell you he was never a great barn cat. He was big, sure, and he caught enough of the local rodents to earn his keep, but if you gave him the choice he’d spend the day napping in your lap, not wreaking havoc on the local mouse population. He looked into your eyes when you spoke to him, never ran or hid at the sound of a carrier door, and responded to a scratch behind his ears with a chirp and a roaring purr. He was extraordinary, even before the fire. 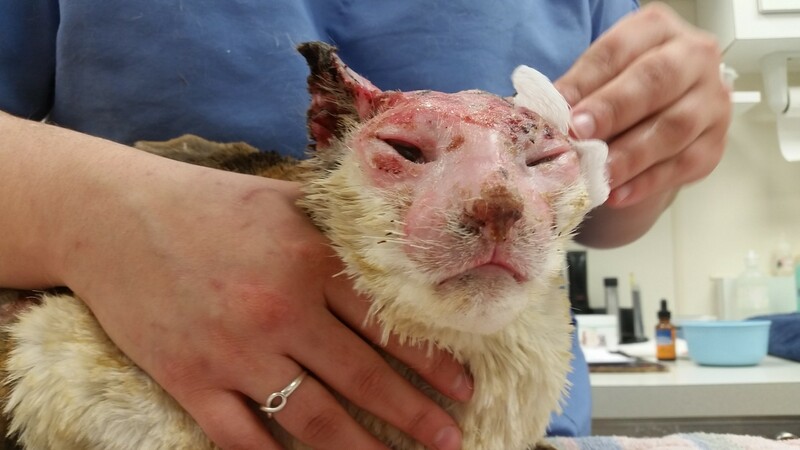 Larry came to Manchester Vet Clinic without a name and without much hope. 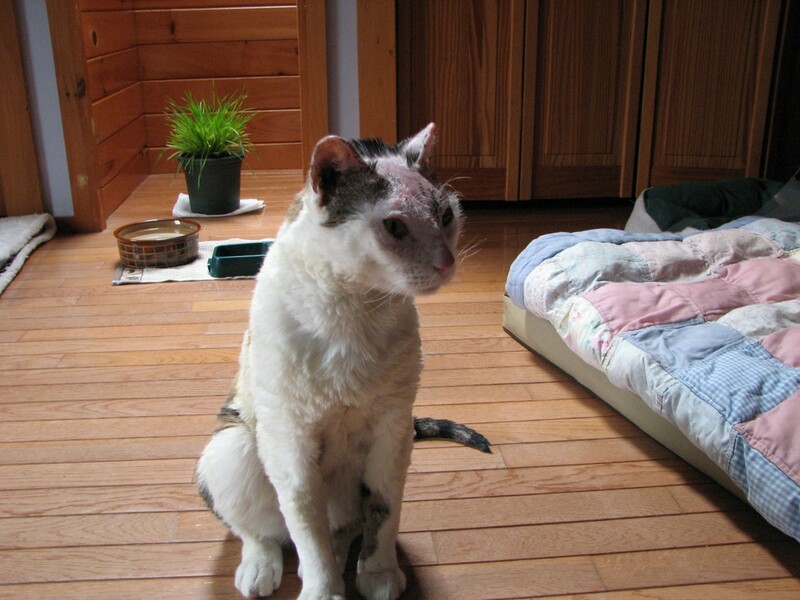 His family identified him as “Maybe Larry, maybe Moe… we can’t tell for sure.” He had come home days after his family’s barn had burned down, his eyes swollen closed, his markings unrecognizable under layers of soot. His breath came in wheezes and puffs and his paws and side were charred and raw. He must have been in immeasurable pain but as the doctors examined him he made no complaints. 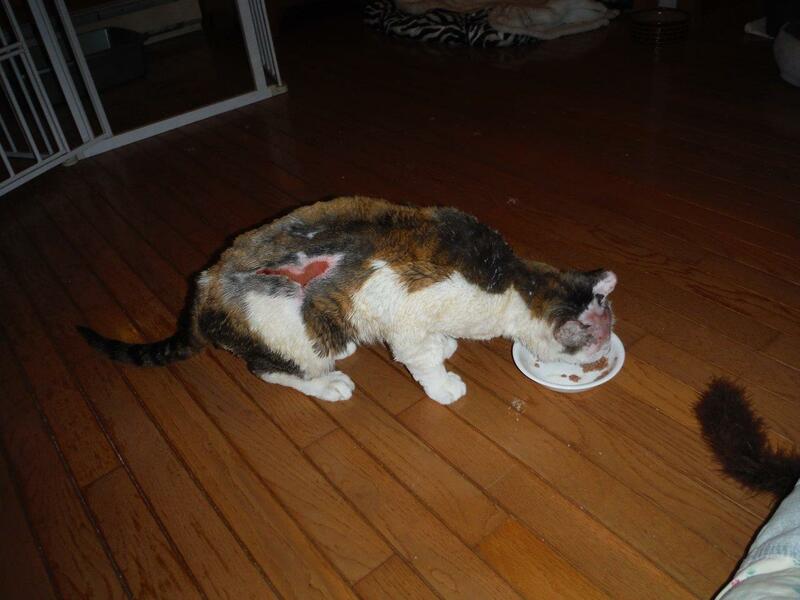 They felt for broken bones and wounds too grievous to heal to see if there was a life to save in this poor creature. Fortunately for Larry, for the hospital, and for me, they found one and got right to work saving it. For the first week of his stay, Larry slept. He would wake to greet me as I started and finished shifts, he would sniff indifferently at the food I offered, and he would sleep. Over the next few weeks there was more eating and less sleeping and as his wounds shrunk, his personality grew. 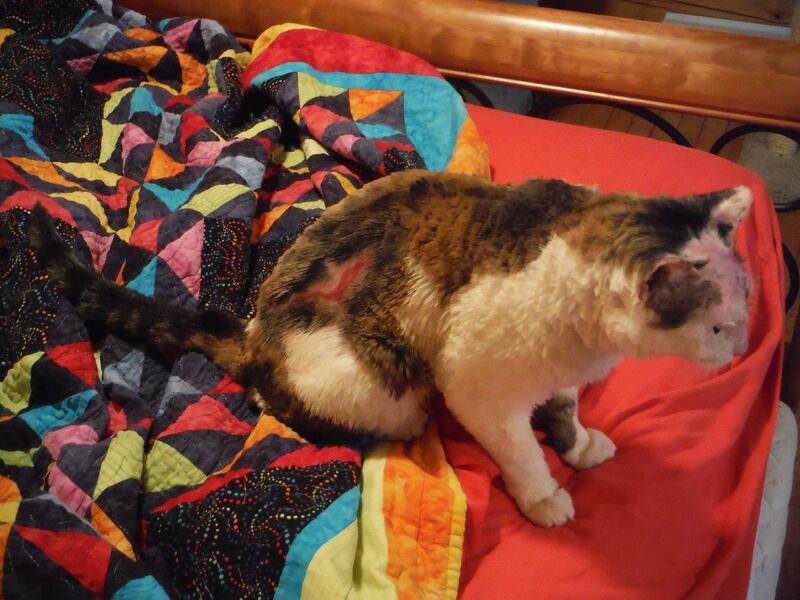 His second week here the doctors were unable to hear his heart and lungs over his thunderous purr. His third week he opened his eyes to watch birds out the window, an activity we did every day after that. His fourth week he started eating well and once he started, we hardly let him stop. He gained back all of the weight he had lost with interest and his appetite never faltered. He rocketed from 10 to 12 pounds in just under a month and has continued the trend since; at his last visit he weighed in at a healthy 14 pounds. His treatments shifted from ­­­­­­­­­­­­­­­improving his comfort to keeping up with his healing. 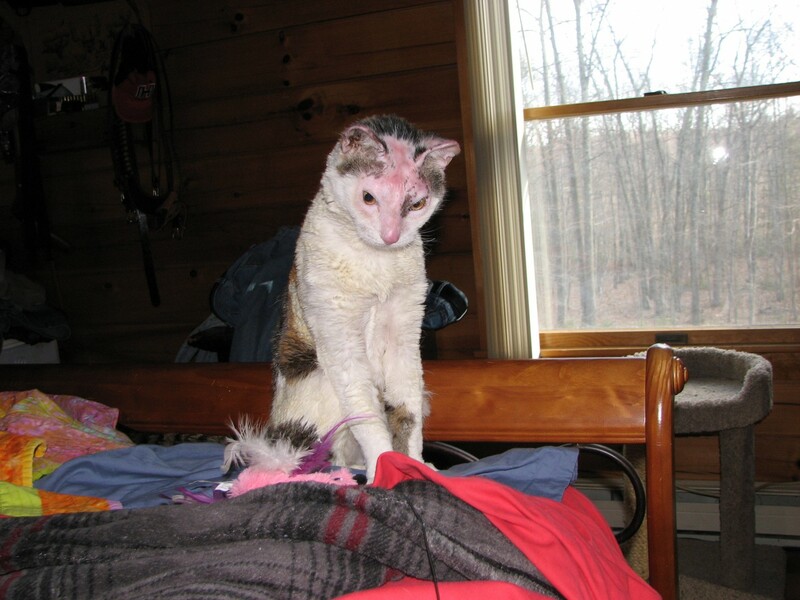 I spent hours a day soaking his feet in bowls of warm water and rubbing wound salve on his head and side and Larry spent hours a day knocking over bowls of warm water and wiping wound salve onto my arms and clothes. As our friendship grew around these hours together, he insisted on sharing his wound balm even more exuberantly. Every day at 2, when our staff met for our daily meeting, I would frost him with ointment; every day at 2:15, as we dispersed and went about our days, he would return the favor. The skin on my face and neck had never been healthier. Treatment time quickly turned into play time. I would get through his list of ointments and soaks while he chowed down a can of food and then we’d romp around the hospital. He’d spend time looking out the window at the local birds, running from one end of the hospital to the other, and chasing string across the treatment room floor; I’d spend time holding him up to the windows, chasing him from one end of the hospital to the other, and dragging string across the floor. We’d turned into a regular comedy act. As time went on, Larry continued to heal with impressive speed. 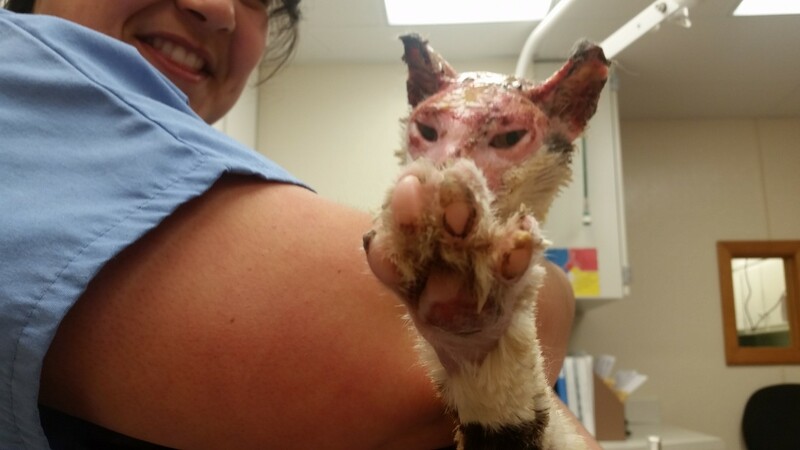 His singed fur was replaced by growing fur, the angry red of the burns on his face and side dulled to shiny pink scars, and his feet scabbed and healed until he could walk comfortably again. His family, who had been visiting throughout his stay with us, marveled at his recovery. The Larry that had been carried through our doors wounded and unresponsive less than two months ago had been replaced with a Larry that raced around his exam room rubbing up against legs and begging to be cuddled. The discussion of when to send him home was introduced and resolved: Larry’s sixth week with us would be his final, it was time to go home. As his family made preparations for his homecoming, a cloud hung over my head. It was hard to imagine coming to work and not seeing my buddy but I knew that he was ready to go home. After six weeks of holding him every day during our mid-day meeting, six weeks of treatments, six weeks of extraordinary Larry, it was tough to say goodbye. His family came late in the evening and spent over an hour with Dr. Babuska and myself. We talked about his time with us, the long road ahead of him, and the memories we had made. His family talked about his amazing recovery, the house he was returning to, and how thrilled they were to take him home. When he finally climbed into his carrier and was ferried out of our doors, exactly 6 weeks after he had been brought in, I was excited for him to start his new life with this amazing family. 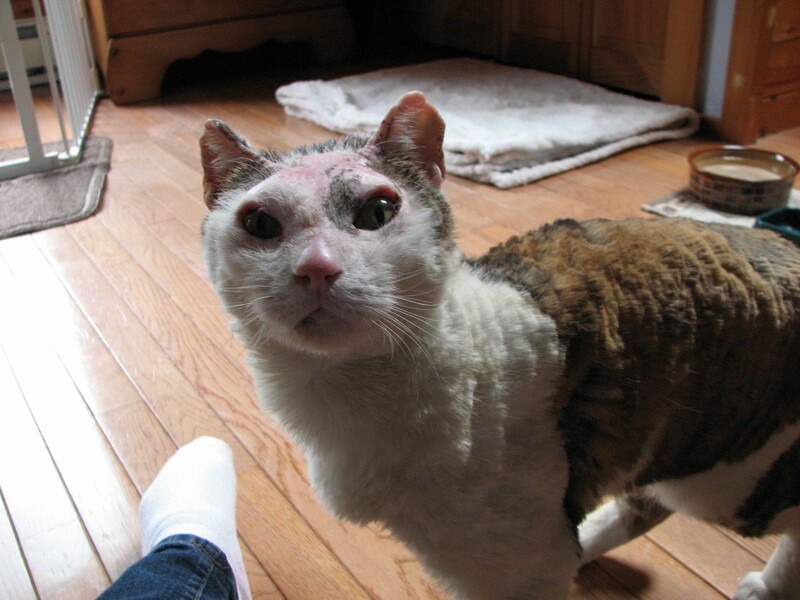 I have seen Larry a few times since then; the shiny scar on his forehead is softened with freshly-grown fur, his paws are pink and tender again, and he is exactly as extraordinary as he was the first day I saw him.